William Riley BARNETT [Parents] was born in 1807 in , , Georgia. He died on 29 Dec 1950 in Tuscaloosa, Tuscaloosa, Alabama. William married Sarah WARREN on 17 Mar 1845 in , Calhoun, Alabama. Sarah WARREN was born in 1812 in , , South Carolina. She died in 1880 in Tuscaloosa, Tuscaloosa, Alabama. Sarah married William Riley BARNETT on 17 Mar 1845 in , Calhoun, Alabama. Umbel M. BARNETT was born in 1846 in , , Alabama. N. BARNETT was born in 1848 in , , Alabama. William Uriah Monk BARNETT was born in 1849 in , , Georgia. He died on 23 Mar 1923 in , Jefferson, Alabama. M. BARNETT was born in 1856 in Benton, Calhoun, Alabama. Martin DAVIS was born in 1808 in , Greene, Georgia. He died on 28 Jun 1878 in , Attala, Mississippi. Martin married Jemima "Mimi" BARNETT on 13 Sep 1830 in , Hall, Georgia. Jemima "Mimi" BARNETT [Parents] was born in 1812 in , , Georgia. She died on 29 Jan 1878 in , Attala, Mississippi. Jemima married Martin DAVIS on 13 Sep 1830 in , Hall, Georgia. Freeman Hardy BARNETT [Parents] was born on 4 Mar 1815 in , , Alabama. He died on 7 Jul 1907 in Tuscaloosa, Tuscaloosa, Alabama. Freeman married Jemima Ann JERRELLS in 1847. Jemima Ann JERRELLS was born in Jul 1819 in , , Tennessee. She died in Apr 1907 in , , Mississippi. Jemima married Freeman Hardy BARNETT in 1847. Rhoda BARNETT was born in 1848 in , , Alabama. James BARNETT was born in 1850 in , , Alabama. Uriah BARNETT was born in 1852 in , , Alabama. M iv W. J. BARNETT was born in Aug 1852. Seaborn BARNETT was born in 1853 in , , Mississippi. Frank BARNETT was born in 1856 in , , Alabama. Keziah J. BARNETT was born in 1859 in , , Mississippi. Isaac Calvin BARNETT was born in 1860 in , , Mississippi. He died in 20 Nar 1829 in Gonzales, Texas. Isabella BARNETT was born in 1861 in , , Mississippi. Mary Martha Ann BARNETT was born on 3 Jul 1863 in , , Mississippi. Elisha BARNETT was born in 1865 in , , Mississippi. Sarah BARNETT was born in 1868 in , , Mississippi. 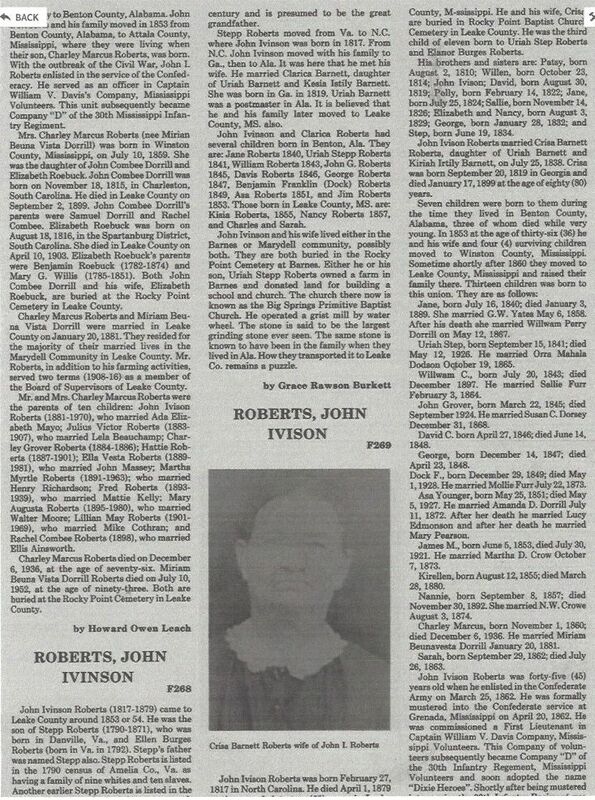 John Iverson ROBERTS [Parents] was born on 27 Feb 1816 in , Gwinnett, Georgia. He died on 1 Apr 1879 in , Attala, Mississippi. He was buried in Rocky Point Cemetery, Crossroad, Leake, Mississippi. John married Clarissa "Crissa" BARNETT on 22 Jul 1838 in Calhoun, Alabama. Clarissa "Crissa" BARNETT [Parents] was born on 20 Sep 1819 in Benton, Lowndes, Alabama. She died on 1 Jan 1899 in , Leake, Mississippi. She was buried in Rocky Point Cemetery, Crossroad, Leake, Mississippi. Clarissa married John Iverson ROBERTS on 22 Jul 1838 in Calhoun, Alabama. F i Jane Louise ROBERTS was born on 16 Jul 1840. She died on 3 Jan 1880. M ii Pvt. Uriah Step ROBERTS was born on 15 Sep 1841. He died on 12 May 1926. M iii William Calvin ROBERTS was born on 12 Jul 1843. He died in Dec 1897. M iv John Greenbury ROBERTS was born on 22 Mar 1845. He died on 6 Sep 1924. David Freeman ROBERTS was born on 27 Apr 1846 in Benton, Lowndes, Alabama. He died on 14 Jun 1848 in Benton, Lowndes, Alabama. George Riley ROBERTS was born on 14 Dec 1847 in Benton, Lowndes, Alabama. He died on 3 Apr 1848 in Benton, Lowndes, Alabama. M vii Benjamin Franklin "Doc" ROBERTS was born on 28 Dec 1849. He died on 1 May 1928. M viii Asa Younger ROBERTS was born on 25 May 1851. He died on 5 May 1927. James Martin ROBERTS was born on 5 Jul 1853 in , Benton, Alabama. He died on 30 Jul 1921 in , Yazoo, Mississippi. Kissiah Ellen ROBERTS was born on 12 Aug 1855 in , Benton, Alabama. She died on 28 Mar 1880. Nancy Isabel ROBERTS was born on 8 Sep 1857 in , Attala, Mississippi. She died on 30 Nov 1892. She was buried in Rocky Point Cemetery, Crossroad, Leake, Mississippi. M xii Charles Marcus ROBERTS was born on 1 Nov 1860. He died on 6 Dec 1936. Sarah Crisse ROBERTS was born on 29 Sep 1862 in , Leake, Mississippi. She died on 26 Jul 1863 in , Leake, Mississippi. Joseph Wesley KUYKENDALL "Sr" [Parents] was born on 23 Mar 1879 in , Garrard, Kentucky. He died on 25 Feb 1950. Joseph married Sallie GAFFNEY on 4 Sep 1905. Sallie GAFFNEY was born on 15 Jul 1890 in Lancaster, Garrard, Kentucky. She died on 1 Feb 1952. Sallie married Joseph Wesley KUYKENDALL "Sr" on 4 Sep 1905. Clara Mae KUYKENDALL was born about 1906 in , , Kentucky. She died about 1908 in , , Kentucky. Willa Lee "Billie" KUYKENDALL was born on 2 Aug 1908 in , , Kentucky. She died about 1999. Bruce KUYKENDALL was born about 1910 in , , Kentucky. Kermit R. KUYKENDALL was born on 1 Aug 1912 in , , Kentucky. He died on 2 Dec 1970 in Christ Hospital. Ray Wesley KUYKENDALL was born on 4 Sep 1914 in Whitland, Indiana. He died on 11 Sep 1969 in Orlando, Orange, Florida. F vi Elizabeth KUYKENDALL was born on 23 May 1916. She died on 25 Dec 1943. Charles William KUYKENDALL was born on 13 Oct 1917 in , , Indiana. He died on 26 Dec 1943. Eugene Nelson KUYKENDALL was born on 6 Jan 1920. Alice L. KUYKENDALL was born on 30 Jan 1921 in , Garrard, Kentucky. She died on 14 Jun 1930 in , Madison, Kentucky. Leroy KUYKENDALL was born on 11 Apr 1923 in , Madison, Kentucky. He died on 22 Mar. Elias Brendenburg KUYKENDALL was born on 25 Jun 1925 in , Madison, Kentucky. He died on 21 Nov 1943. Joseph Wesley KUYKENDALL "Jr" was born on 28 Jun 1927 in , Madison, Kentucky. He died on 5 Oct 1952 in Lancaster, Garrard, Kentucky. F xiii Lucille G. KUYKENDALL was born on 22 Apr 1929. She died on 4 Jun 2005. Eliaha SPARKS was born in 1824 in , , Alabama. Eliaha married Isabelle BARNETT. Isabelle BARNETT [Parents] was born in 1824 in , , Alabama. She died in , , Mississippi. Isabelle married Eliaha SPARKS. John Wesley MADDOX "Sr" [Parents] was born in 1829 in , , Georgia. He died on 17 Sep 1862 in Petersburg, Dinwiddie, Virginia. John married Celia A. HUBBARD on 7 Jun 1853 in Fayetteville, Fayette, Georgia. Celia A. HUBBARD was born on 1 May 1830 in , , Georgia. Celia married John Wesley MADDOX "Sr" on 7 Jun 1853 in Fayetteville, Fayette, Georgia. Wiley J. MADDOX was born on 8 Mar 1845 in , , Alabama. He died on 17 Nov 1916 in , Jackson, Florida. Elizabeth MADDOX was born about 1850 in , , Alabama. Emeline MADDOX was born about 1853 in , , Alabama. M v Henry C. MADDOX was born in 1854. M vi Elijah Calvin MADDOX was born on 15 Aug 1858. He died on 2 Dec 1918. M vii John Wesley MADDOX "Jr" was born on 16 Jan 1858. He died on 6 Feb 1947. Tompy MADDOX was born about 1859 in , , Alabama. Calvin MADDOX [Parents] was born in 1832/1834 in , , Georgia. Calvin married Eliza about 1854. Eliza was born in 1841 in , , Mississippi. Eliza married Calvin MADDOX about 1854. Indiana MADDOX was born in 1855. Andrea MADDOX was born in 1857. Alfred M. MADDOX [Parents] was born in 1834/1836 in , , Georgia or Alabama. Alfred married Mary about 1858. Mary was born in 1836 in , , Mississippi. Mary married Alfred M. MADDOX about 1858. Cynthia A. MADDOX was born in 1859/1863 in , , Mississippi. She died in 1892. She was buried in Chestnut Mountain Presbyterian Church Cem..
Walter Netherby GRAHAM [Parents] was born in 1575 in Netherby, Cumberland, Scotland. He died on 2 Nov 1635 in Meilillwood Gargunnock, Stirling, Scotland. Walter married Sibil BELL. Sibil BELL was born in 1570 in Largo, Fifi, Scotland. She died in 1630 in Largo, Fifi, Scotland. Sibil married Walter Netherby GRAHAM. M i Richard GRAHAM was born in 1590. He died on 28 Jan 1654.